A slightly different version of this shot is shown in high resolution here. This was taken in September in the town of Bad Nauheim. 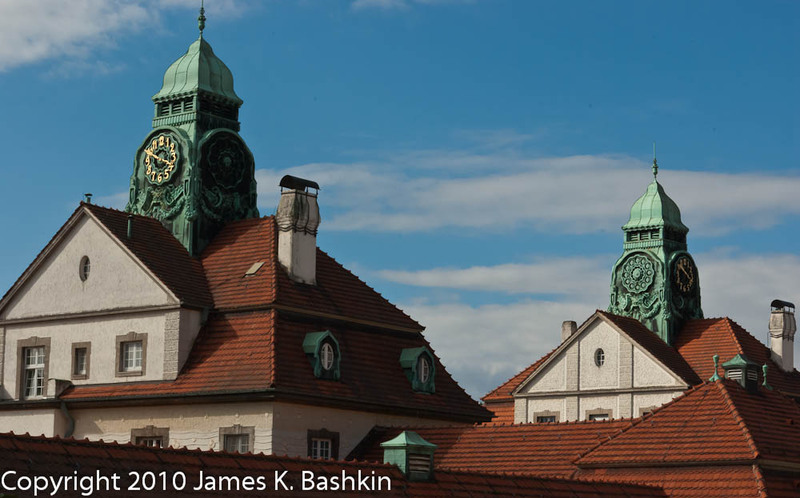 The town is famous for its Art Nouveau buildings (or jugendstil, in German) and mineral baths, and the towers pictured here preside over the traditional bath house, now a museum. The baths are still available, however, and one can breath in the water vapor in the various Inhalatorium structures found in town (I've posted a photo of one on this forum). Bad Nauheim is also famous because Elvis lived there while stationed in Germany, for its public music school, and GOFI, the International Guitar Orchestra Festival which happens every two years. I see flaws here. Hmmm. Must have had rain drops dry on my lens... should have seen them before (or cleaned the lens!). IMGP3227 edited again 2 again | Flickr - Photo Sharing! IMGP3227 edited again 3 again | Flickr - Photo Sharing! IMGP3227 edited again again | Flickr - Photo Sharing!